There are certain things in life that indicate that you've arrived. Playing golf with the President. Hiring Beyoncé for your child's birthday party. Driving anywhere in this spectacular Audi R8. Fortunately for us normal people, you can enjoy the thrilling last part for the price of a moderately equipped BMW M3. 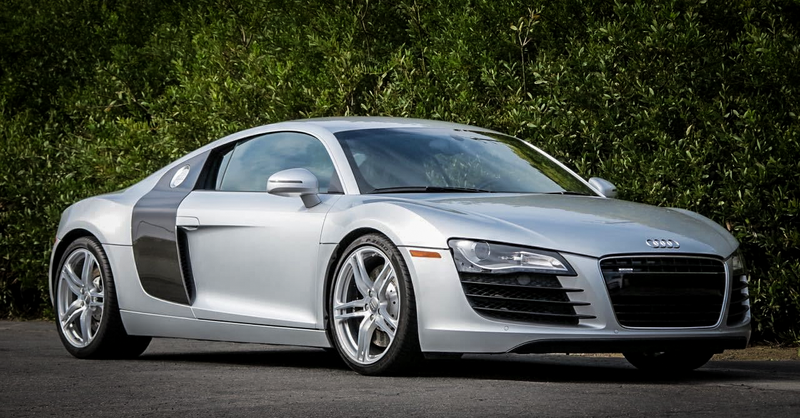 This 2008 Audi R8 is one of the sexiest cars to ever come off a production line. Its elegant body lines, minimalistic design and iconic front end set it apart from any other car in its price range. It's also freaking fast. It's rev-happy 420 horsepower 4.2 liter V8 got it from 0-60 miles per hour in about 4 and half seconds, with a 190 mile per hour top speed. Its all wheel drive also made sure that on hard shifts, your head would snap off if not thoroughly bolted to your neck. It is complete with all keys, owner's manuals, window sticker and exclusive R8 marketing materials sent to owners by the factory. The tires are in good shape and the services are up to date. This is an excellent opportunity to buy an R8 with all of the best options – the Carbon Sigma Side Blade really sets off the Ice Silver Metallic Paint and the Enhanced Leather Package with Bang & Olufsen Sound System complete the supercar interior. Not to mention, the 6-speed manual transmission is smoother and more fun in daily life. The Audi R8 is a dream car that you can own today, as a reachable and demonstrable goal. It puts the finish line within reach, while being a phenomenal performer in every possible aspect of the word. I'd challenge anyone to find a real world exotic that delivers this kind of value, desirability, refinement, and reliability for this kind of money. Pick it up before the next person does.